One of President Trump’s signature campaign promises, one that had actually universal resonance, was his pledge to tackle the United States opioid epidemic, a public health crisis that claimed the lives of 47,600 Americans in 2017, according to data from the Centers for Disease Control and Prevention (CDC). To put the sheer enormity of the impact of opioids in perspective, there were a little over 70,000 overall drug deaths that same year, according to the CDC. This crisis is leading to unprecedented rates of fatality and requires multilateral institutional intervention, including adequate money to properly fund treatment and prevention initiatives. During the primary and general elections, Trump, like most candidates, made extensive efforts to court votes from New Hampshire not just because it was important for early momentum, but also because the area is a cradle for Northeastern opioid addiction and subsequent fatality. For the first few months of his term, it looked as though developments headed in a positive direction. He declared the opioid crisis a national emergency and assembled a task force whose findings were to serve as a guidebook for the creation of new policy and management. To date, however, the funding and monetary resources to mount the battle against American opioid addiction have been acutely and noticeably disproportionate to the rhetoric. 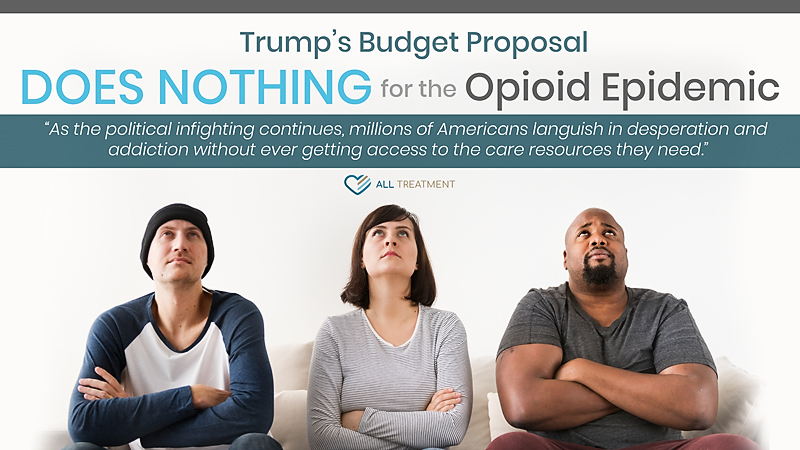 One reality of American government is that ideas are only as viable as the funding behind them, and the current Trump budget proposal for 2020 falls far short of expectations for properly funding opioid addiction treatment and prevention resources. What’s in the New Budget Plan? The limited resources set aside for opioid addiction prevention to select populations in the new Trump budget, including $245 million over ten years to let states “extend Medicaid coverage for pregnant women with substance use disorder to one year postpartum,” is compromised by substantial Medicaid and Medicare cuts and slashes to various opioid-related programs—particularly at the Department of Justice, which provides the front line of enforcement and prevention. Programs like Medicaid provide direct and viable lifelines to treatment and recovery in the United States. Medicaid alone pays for a quarter of all drug addiction treatment in this country. Moreover, Trump himself has acknowledged that these funding resources are inadequate. Last year, his budget plan called for an additional $7 billion for 2019. This year’s budget proposal drops that request. In a budget of $4.7 trillion, less than a billion dollars to fund the nation’s most urgent and pervasive public health crisis is simply not enough. The White House’s Council of Economic Advisors readily admits that the opioid crisis has created over a half a trillion dollars in economic losses. Trump calls for $8.6 billion to fund his border wall, which he claims will stop the flow of heroin and other illegal drugs from international markets; however, experts see these aims as separate and apart from the real conversation surrounding opioid addiction—and they do not see the wall as an effective solution for intervention, as most illegal drugs come into the country through ports of entry. It is the general consensus among the scientific community that properly combating the opioid addiction epidemic requires a multipronged approach of treatment, prevention, legislation, and enforcement initiatives, including medication-assisted treatment (MAT) and proper behavioral rehab resources. A recent study from Stanford University found that a mix of these interventions can save tens of thousands of lives each year. Many experts are calling for funding for opioid addiction treatment and prevention that is comparable to what the United States spends on HIV/AIDS treatment. As it stands right now, there is a woefully inadequate lack of specific treatment resources for opioid use disorder (OUD) sufferers and only 10 percent of the people who need help actually get it. 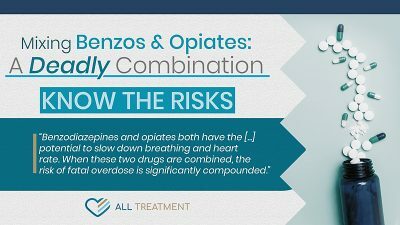 Less than of facilities offer any of the opioid addiction medications such as methadone or buprenorphine as an option, even though the treatment community has designated this as one of the most vital and successful elements of treatment. Ramping up efforts and funding to bolster these resources, and others have been occurring at a snail’s pace and with little follow-through, leaving millions in the crosshairs of fatal overdose. Further complicating matters is the fundamental policy disconnect between the two political parties. There is a basic disagreement on how to properly combat this issue, with the current administration relying heavily on enforcement while overlooking the elemental need for treatment, research, funding, and prevention initiatives. As the political infighting continues, millions of Americans languish in desperation and addiction without ever getting access to the care resources they need. While there have been some significant strides to prevent opioid addiction fatality in recent years, it’s clear from Trump’s newest budget proposal that we still have a long way to go.